Looking for a pair of vegan motorcycle boots? Check out these 10 cruelty free boots so you can ride in style! You'll find options for both men and women. 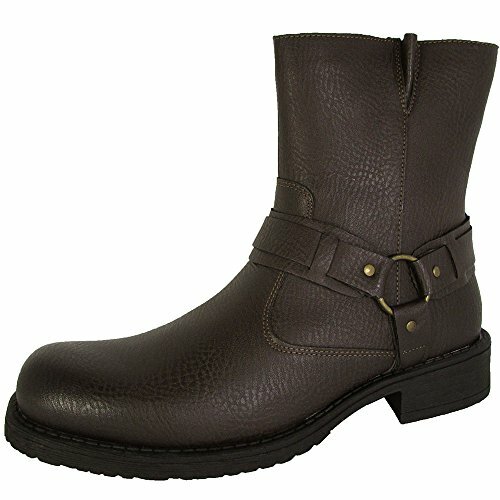 Men's black engineer-style motorcycle boot with a round toe. Has a full-length zipper going down the inner side of the boot for easy on/off access. Two functional and stylish buckles to tighten for an ideal fit. Non-skid rubber sole and double-stitch exterior provide grip and durability. Comfortable design with padded interior. Goes above the ankle for ankle support and protection. Made of water-resistant synthetic leather. Advertised as vegan: No, but these boots are synthetic. Pros: Comfortable, sleek-looking and wearable with any outfit. Good for rain or shine as well as light wear and tear. Cons: Made of thin material that may not provide optimum protection against serious abrasion and rough weather. Not machine washable, but genuine leather boots wouldn't be, either. Reviewers say they run large and may not last with heavy use. These are probably more for casual riding and leisure than for heavy use. 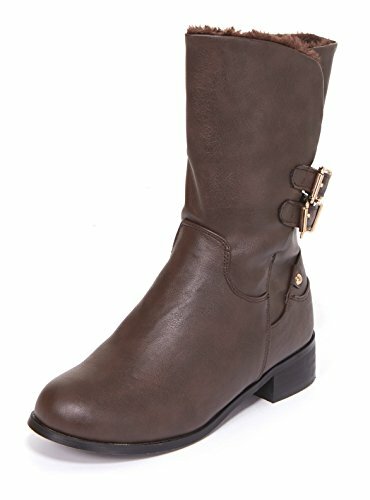 Women's soft faux leather moto boot with low heel in brown. Made of vegan leather with a faux fur lining for warmth and comfort. Nine-inch shaft makes the top of the boot hit the lower to mid-calf area. Camouflaged full-length zipper on the inner side with two gold-colored metal buckles on the outer side to tighten up the fit. Good grip on the ground with skid-resistant rubber heel. Pros: Tall enough to protect the shins from wind while riding. Wearable even after you put your motorcycle away for the winter thanks to the faux fur lining. Cute and fashionable — wear with leggings for a dressier feel or relaxed fit jeans for a laid-back look. Very affordable. Cons: Probably not waterproof, though the vegan leather may provide some water resistance. Run a half to a full size small. 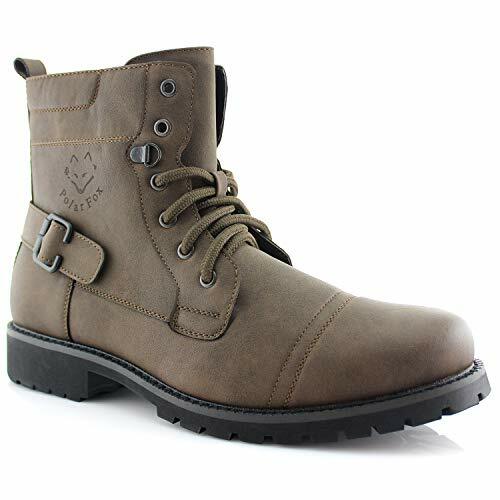 All-synthetic men's cognac-colored combat moto boot that laces up all the way to the top. Full ankle coverage from the combat style that adds protection and support. Burnished leather look with darkened toe adds sophistication. Padded collar and insole for all-day wear to prevent chafing and soreness. Advertised as having an eco-friendly design. Pros: Comfortable and very trendy. Wearable on or off a motorcycle, dressed down with tucked-in jeans or dressed up a little with pleated trousers. Cons: Probably not very warm. Description doesn't mention anything about waterproofing. Not a traditional pair of motorcycle boots, so they may be more for fashion and occasional riding than for sustained riding. Women's black moto-style cool weather boot made from vegan leather and faux shearling. Faux fur lining makes this boot warm and soft inside. Inner side zipper with outer side buckle strap so you can slip it on and off easily and make it tighter around the top. Treated with antimicrobial product to keep the boot dry and neutral-smelling. Advertised as vegan: Yes. The description says "vegan micro buck." Pros: Trim and feminine without being overly dainty. Heavier duty and good for a very casual look. Wearable throughout cooler seasons. Cons: A little narrow in the toes. May not go with a wide variety of clothing options and styles. Limited seasonal use (built for colder weather — think autumn and early spring). 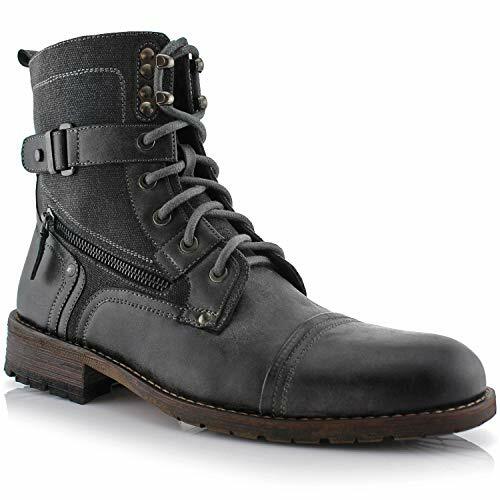 Men's dark gray combat-style motorcycle boot that laces up to the top. Outer side zipper with fashionable inner buckle tab and diagonal zipper for a steampunk vibe. Mixed textile and faux leather body for contrasting texture and style. Made with water-resistant vegan leather. Covered ankle height adds support. Rubber sole lends extra traction all surfaces. Padded inside for long-lasting comfort. Advertised as vegan: Yes — the description says "vegan leather." Pros: Great-looking moto boots that can be worn for style as well as for riding. Perfect for pairing with jeans or tucked-in khaki pants. Cons: The synthetic leather gives off a strong odor that can take a good couple of weeks to dissipate. Though buyers love the look, some mention that the quality isn't high enough to make these boots last a long time with vigorous use. Women's black mid-calf motorcycle boot with harness straps around the ankle. Made from textured vegan leather with a matte finish. Low platform heel for comfortable wear. Offers a unisex aesthetic for a wide variety of styles. Advertised as vegan: The description says "women's vegan boot." Pros: These boots appeal to all sorts of personal tastes because of their low-key look and unisex heel. Probably best matched with casual pants rather than a skirt, but the right dress will give them a modern, high-fashion edge. Cons: Without a full-length zipper, these may not be the easiest boots to put on. Seem to run a full size small. 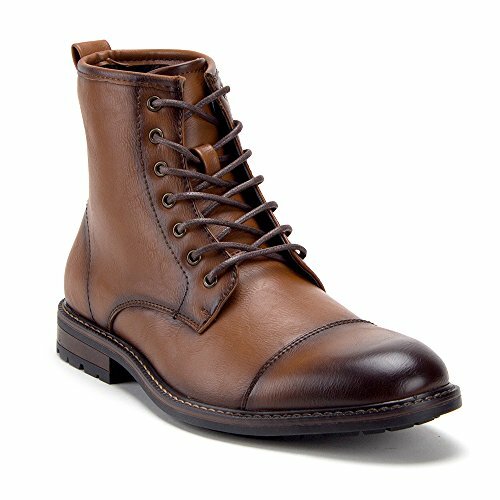 Men's brown motorcycle boot meets lace-up work boot. Stylish buckle strap around the heel and Polar Fox logo on the outer side of the boot. Made from durable, water-resistant vegan leather. Rubber sole for traction and shock absorption. Comfortable inner padding to prevent soreness. Described by the vendor as rugged outdoor boots that can take on a variety of climates and activities. Advertised as vegan: No. They're made of synthetic leather. Pros: Multipurpose boots that can be worn for work, play and motorcycle riding. Comfortable and sleeker than typical work boots, making these ideal for urban or country wear. Reasonably priced. Cons: Not well-insulated and may not be usable in very cold weather, though decent in a short-term chill. Some reviewers use these boots extensively for riding with no issue, but others find that they fall apart quickly. Women's black faux leather ankle-height biker boot with silver studded wraparound straps. Silver embellishments on the straps are varied in shape and size for added texture and intrigue. Cool silver chain across the upper foot. Inner side zipper allows you to slip into the boot without a struggle. Cleated tread for maximum grip on the road. Advertised as vegan: No, but they're advertised as faux leather that "looks just as good as the real deal." Pros: Ultra trendy with plenty of attitude. Make them punk rock with a plaid skirt or play up the biker chick mystique with jeans and a bandana. Easy to clean with a piece of cloth. Cons: No mention of padding or arch support. A little pricey (probably due to trendiness). 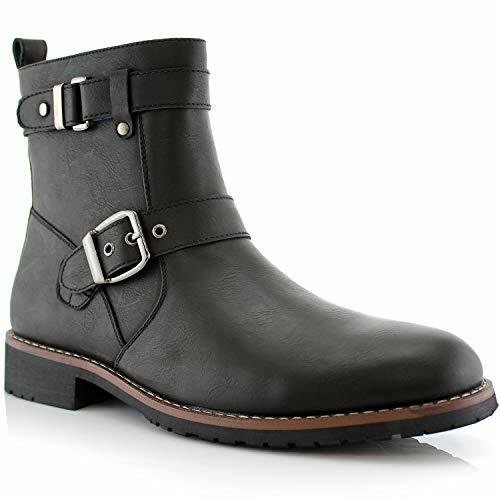 Men's black textured synthetic leather motorcycle boot with a square toe and stylish ankle harness. Totally covered ankle offers good protection when riding. Full-length zipper prevents a struggle to get your foot inside. Rubber outsole should give good stability on the road and on slick surfaces. Advertised as vegan: No, but the product description shows man-made materials. Pros: Very cheap and comfortable. Simple in design so that these boots can be worn with anything. For the price, these boots receive a surprising amount of approval for good quality. Cons: There's no information on a warmth rating, so it's difficult to tell what climates these boots are suitable for or how toasty or cool your feet would be. 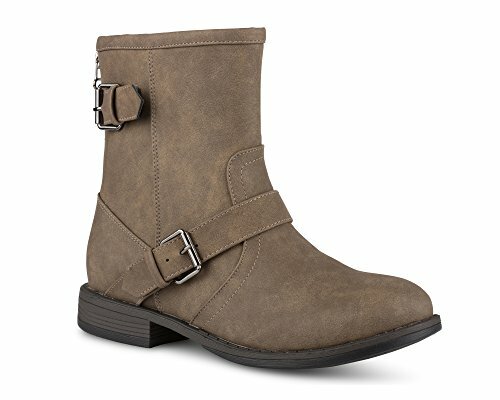 Women's gray faux leather motorcycle boot with zip closure at the back and buckle straps on the outer side. Heavy-duty rubber sole for good grip on all surfaces. Buckle straps are adjustable so you can get a tighter fit. Short stacked rubber heel and slender body. Advertised as vegan: No, but they're made of faux leather and rubber. Pros: Great for an effortless look, and quite cheap for fashion boots. Light-weight and comfortable. Cons: Run on the small side.